Is there a more sublime film than The Leopard? Luchino Visconti’s 1963 adaptation of Giusseppe Tomasi di Lampedusa’s novella ‘Il Gattopardo’ surely qualifies as one of the great masterpieces of world cinema. Set in Sicily a century before it was actually made, The Leopard examines the waning influence of the Sicilian aristocracy through the eyes of Prince Gabrizio di Salina, played by Burt Lancaster in possibly his finest role. As trouble brews with Garibaldi’s army around his country estate, the Prince decides to shift his extended family to his grand palazzo in the hilltop town of Donnafugata. When they arrive, the entourage heads first to the church, as tradition dictates, to pay their respects and lay claim to their elevated place in the community. As they sit listening to the service, covered with white dust from their long journey, the camera slowly tracks past them one by one. They look like statues, marble relics from another era but one of them, in particular, has a lot of life in him yet; the Prince’s hot-headed nephew Tancredi (a ridiculously handsome Alain Delon). 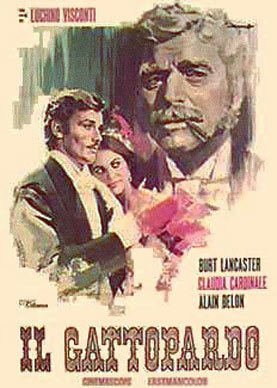 When Tancredi claps eyes on the local Mayor’s ravishing daughter (an equally exquisite Claudia Cardinale), he is instantly smitten and the pair bonds at a lavish ball hosted by the Prince. There, among hundreds of guests all dressed in voluminous gowns and military regalia, they swirl in a rapturous waltz. They are from different classes and, in other times, may never have met but their union heralds a new order on the island and, metaphorically, the birth of democratic Italy. This astonishingly rich film with its wonderful camera work by Giuseppe Rotunno won the Palme D’Or at Cannes. And, despite the fact that Lancaster is speaking in English throughout (dubbed into Italian) the illusion of a world in decay is intact with nothing lost in translation.